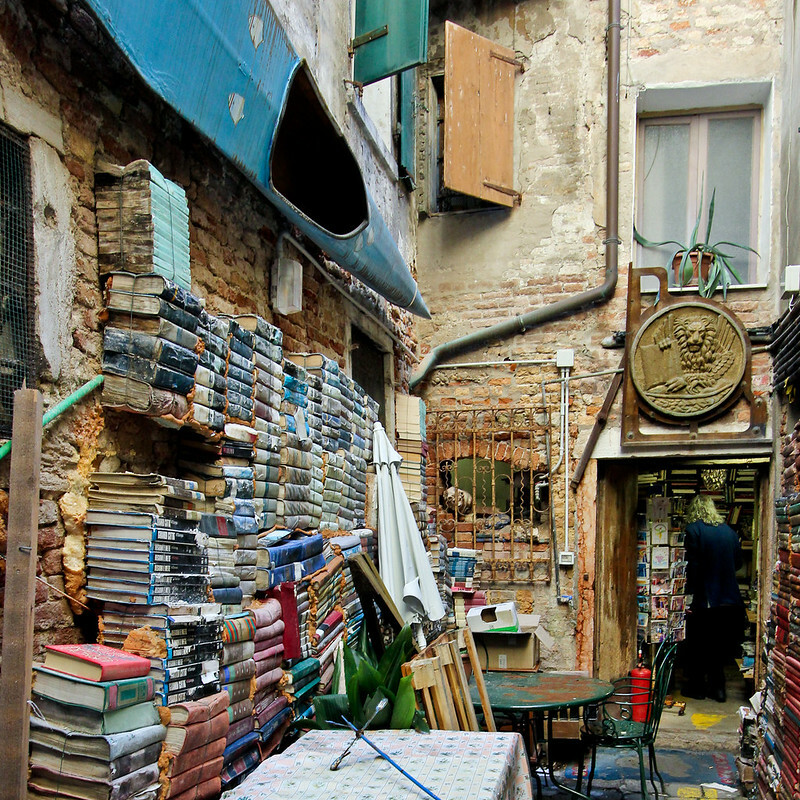 If you are a bibliophile and you want to see a different side of Venice, be sure to visit the Libreria Alta Acqua. It’s filled with books, new and used, in every conceivable floating device (gondola, rowboat, canoe, etc.). The “fire exit” leads directly to a canal. How thoughtful of the management to provide flippers. While I was taking this photo, a boat passed by. 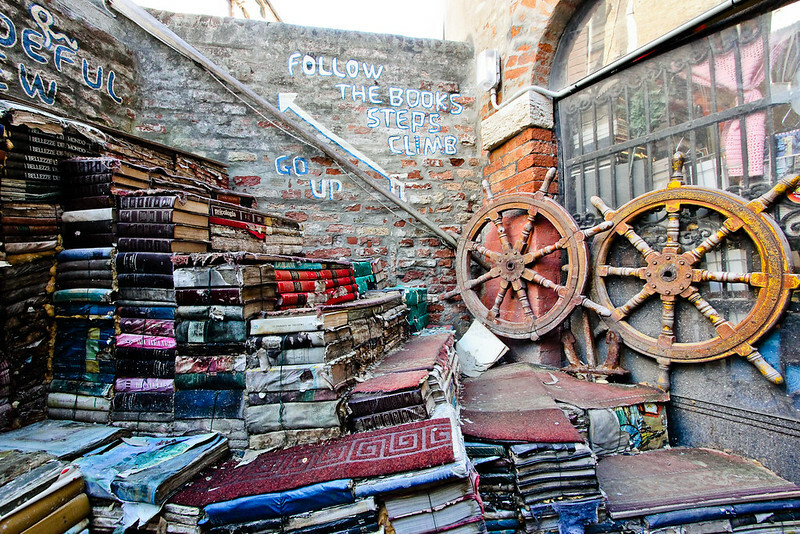 The entrance has stacks of water-damaged books wired to the wall, under a blue kayak. There’s no discernible order to the collection. 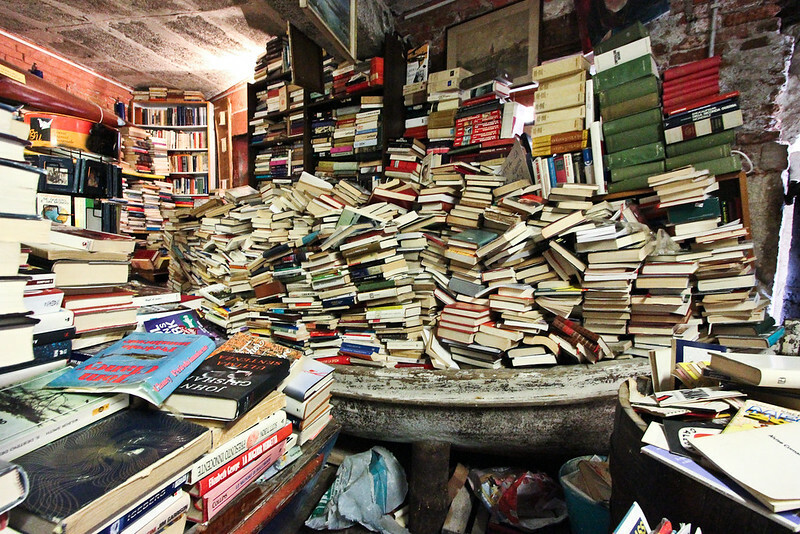 Be prepared to rummage through the piles. Here’s the view from the top of the steps. The patio is actually below the level of the canal wall, so it must get quite wet during high tide. 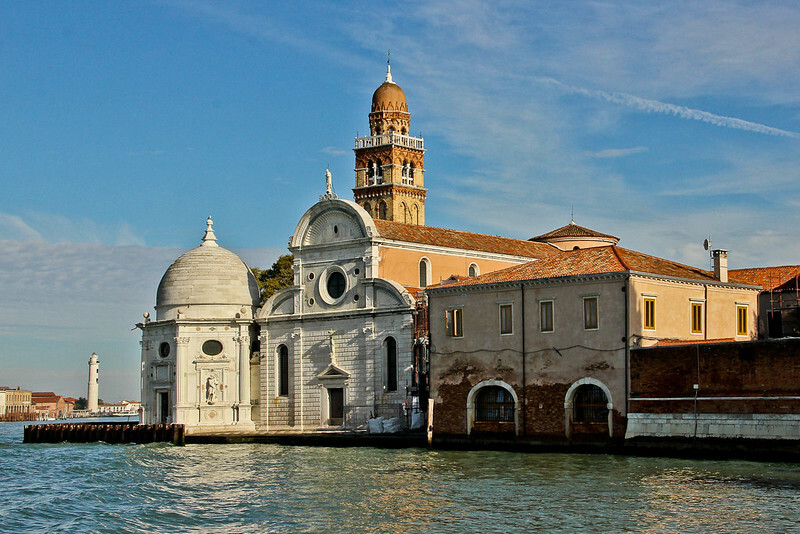 If you take the vaporetto to Burano, you will pass the abandoned island of Madonna del Monte (mountain? really?). It has been the site of a monasteries since the middle ages; Napoleon destroyed the last one. The building in the photo below was built in the 19th century, as a powder magazine. The island is eroding rapidly because the retaining wall has crumbled. 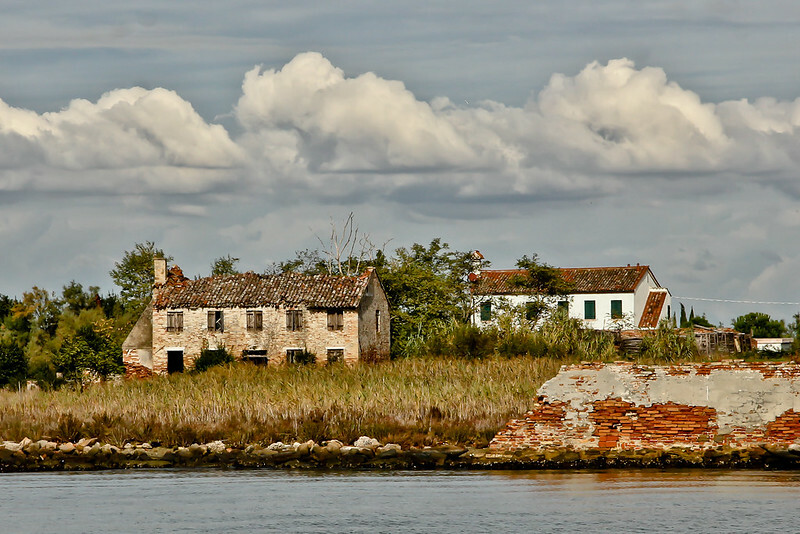 I’m not sure where I photographed these houses, but they were on the #12 vaporetto route from Torcello. Maybe Isola dei Laghi, but I haven’t been able to track them down on Google earth view. 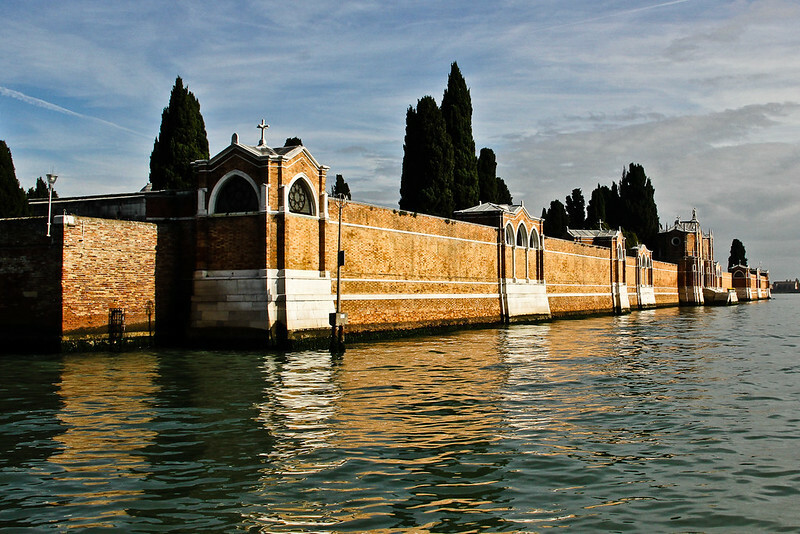 San Michele in Isola, on the cemetery island (Cimitero di San Michele). I’ve never stopped there, but I hope to some day. 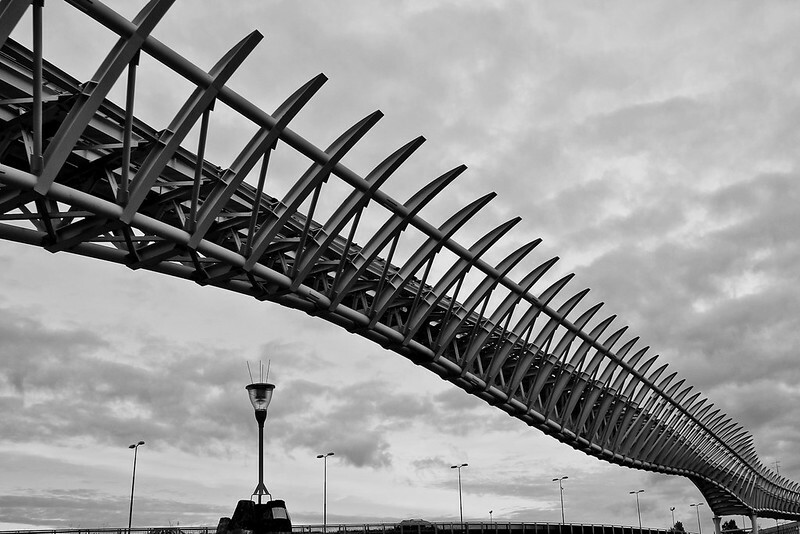 This strange-looking beast is the bridge for the Venice People Mover. The monorail train connects the historical center of Venice with the Marittima cruise terminal and Piazzale Roma, the point of entry for buses, trains, cars, and the Tronchetto parking island. Personally, I’ll stick with the vaporetti and my own two feet…. 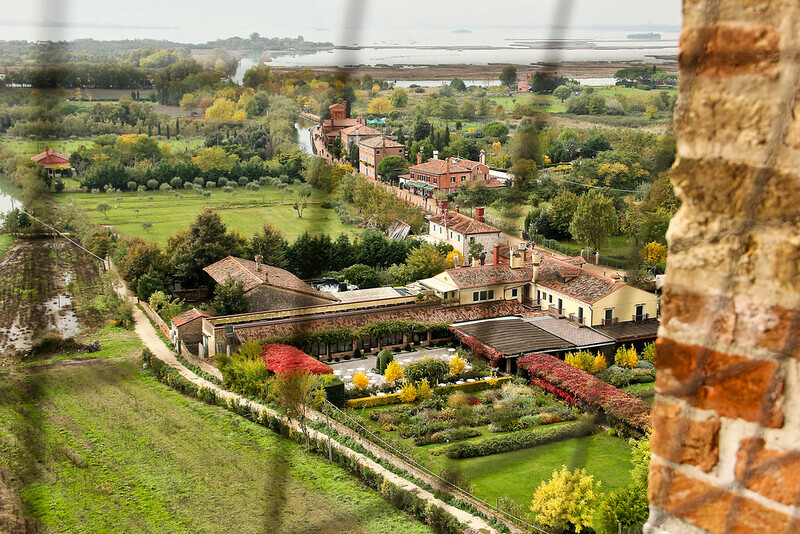 Sorry to keep you hanging–when I reread my Torcello post, I realised that I’d posted a photo of the beginning of the climb up the tower without posting a photo of the view! 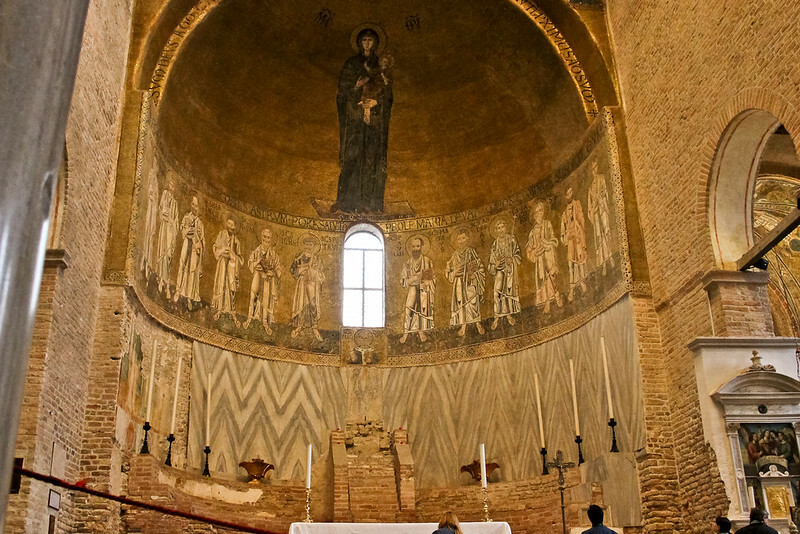 These aren’t the greatest photos, but I hope they give you an idea of what Torcello looks like. 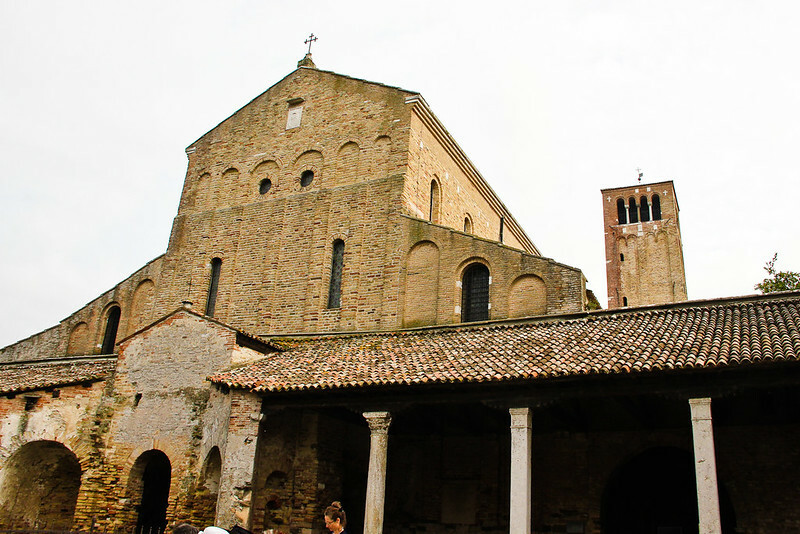 It’s hard to believe that Torcello ever supported thousands of inhabitants and 16 (yes!) parish churches. 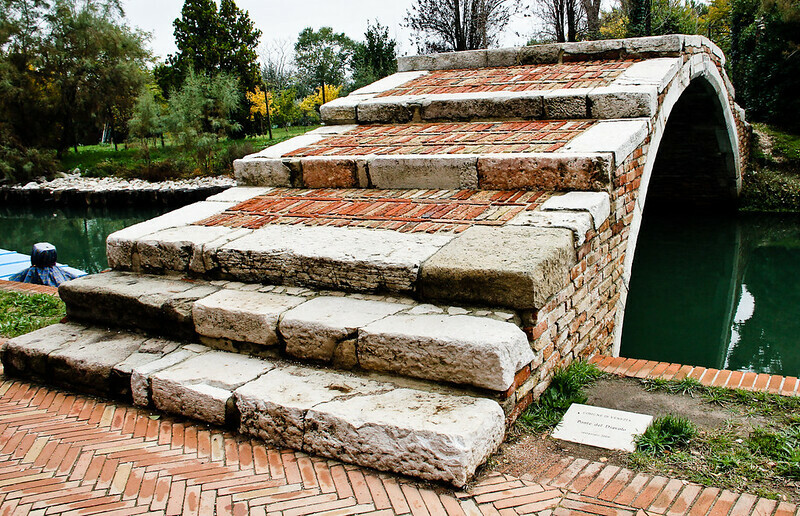 The stones were taken to the Rialto (literally, ‘high bank’) area for building and the lagoon started encroaching on Torcello. On this side, there are no signs of habitation except for the occasional boat or dock. The sky was overcast when we arrived, contributing to the desolate atmosphere. You can almost believe that the island is haunted. 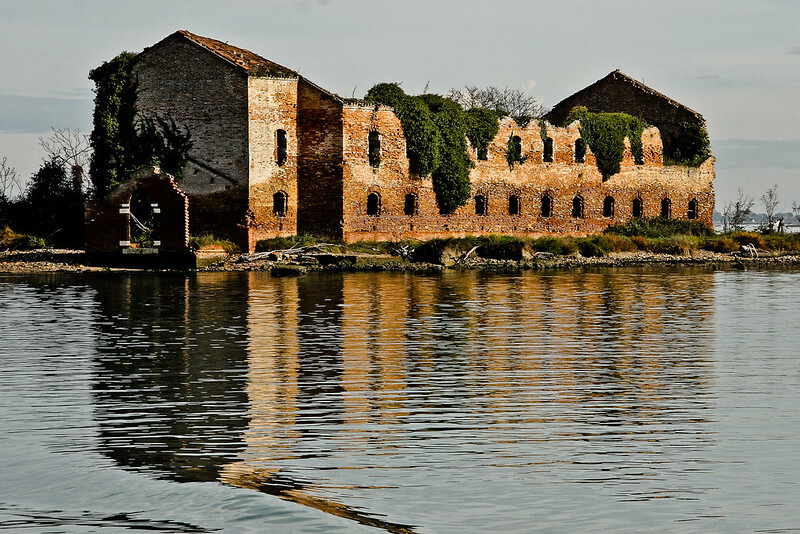 Torcello is very close to Burano, the lace-makers’ island with colorful houses and leaning tower. 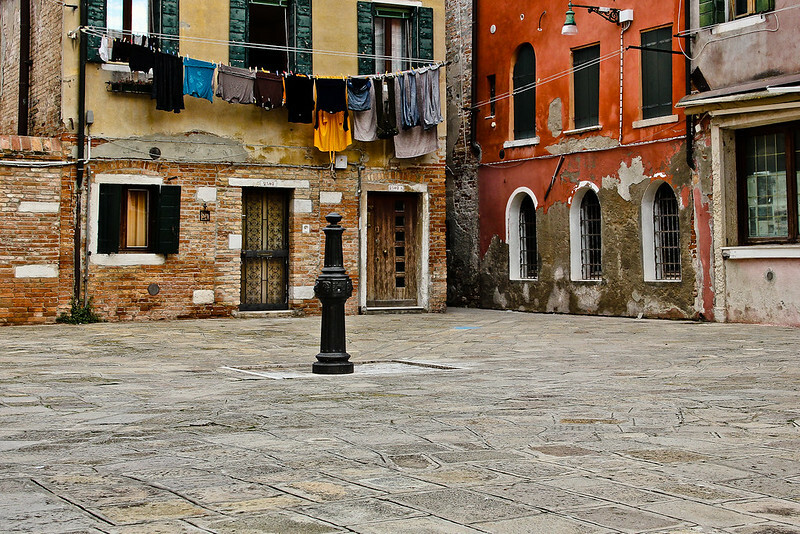 The next photo is a view of the main, and maybe only, street from the dock to what remains of Torcello. The houses have been converted into restaurants and tourist shops. The beautiful garden in the foreground is Locanda Cipriani, one of the oddities of Torcello –a 4-star restaurant in the middle of nowhere. During its 80-year history, the restaurant has hosted celebrities, royals, and Ernest Hemingway, who spent the fall of 1948 at the Locanda. If the name “Cipriani” rings a bell, you’ve probably heard about Harry’s Bar in Venice, which was featured in Fellini’s iconic film, La Dolce Vita; the Locanda and Harry’s Bar were opened in the 1930s by Giuseppe Cipriani. Harry’s Bar was another celebrity magnet, a place to see and be seen — without the long boat ride! I had a look at the menu. It’s pricey but not outrageous. We ate our picnic lunch on the dock beside this peaceful area of the lagoon, close to the cathedral. It was so tranquil because the area was deserted. 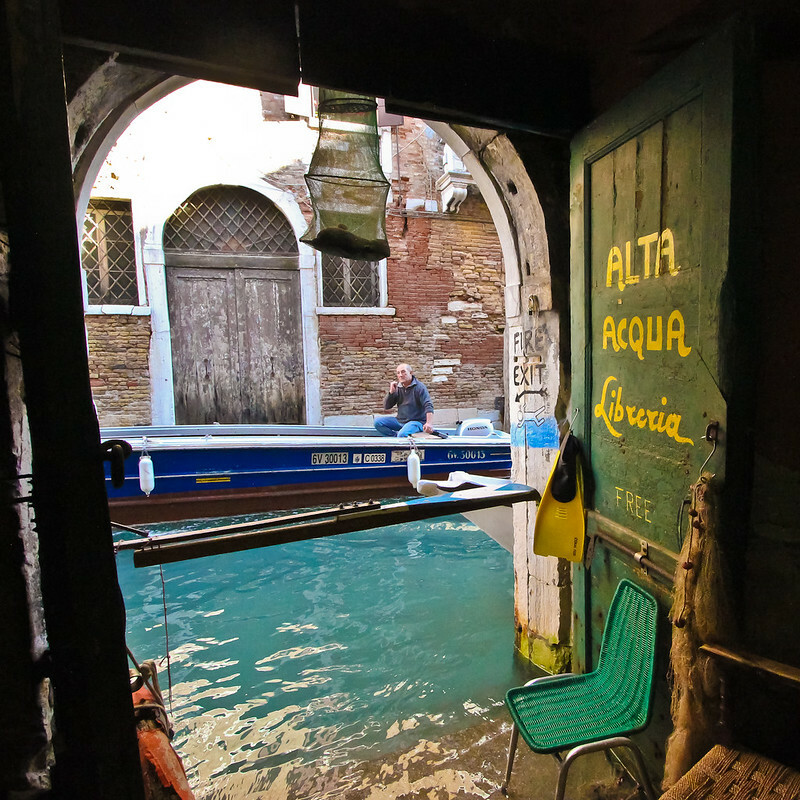 (I hear that it’s much busier during the summer months, but not as crowded as Venice or Murano.) You’ll notice that the weather has changed dramatically. This photo was taken about an hour after the photos from the tower. 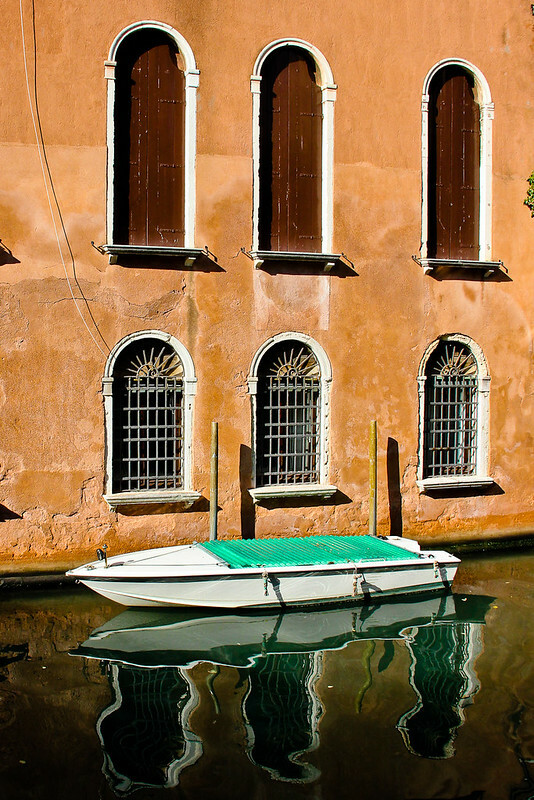 Torcello is sometimes referred to as Venice 1.0. 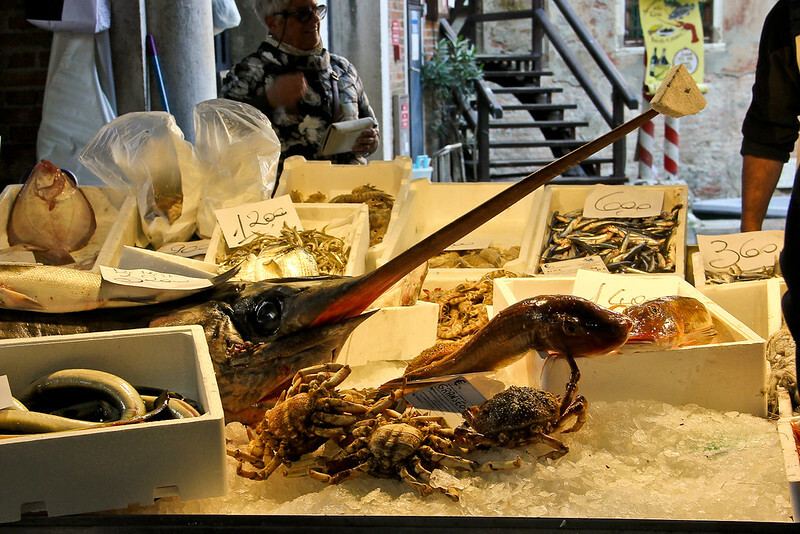 It was founded long before Venice, in the 5th century, and was the main population center of the lagoon until malaria drove the inhabitants to the area around the Rialto bridge in the 12th century. 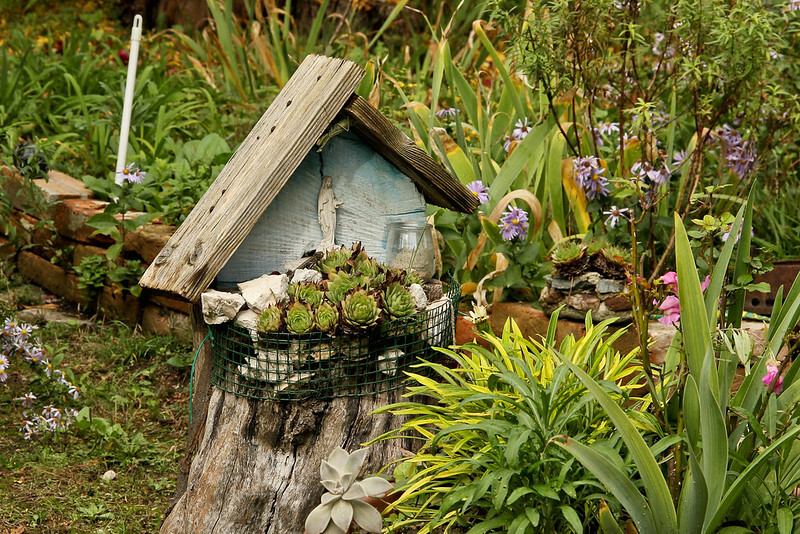 Its current population is said to be 10 (or possibly as high as 75), including the parish priest. 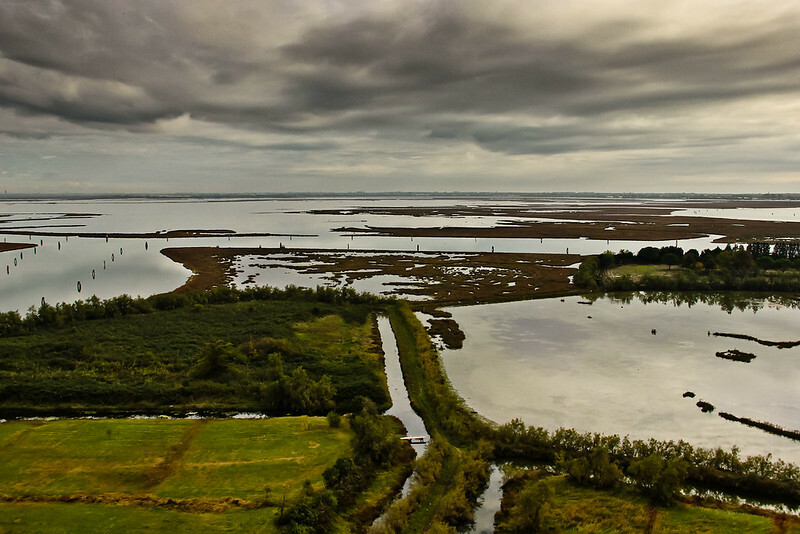 Before 2013, to get to Torcello you had to take the vaporetto (waterbus) to Burano and catch another vaporetto to Torcello, but the #12 route has been expanded so that it is now possible to go directly from the Fondamente Nove. 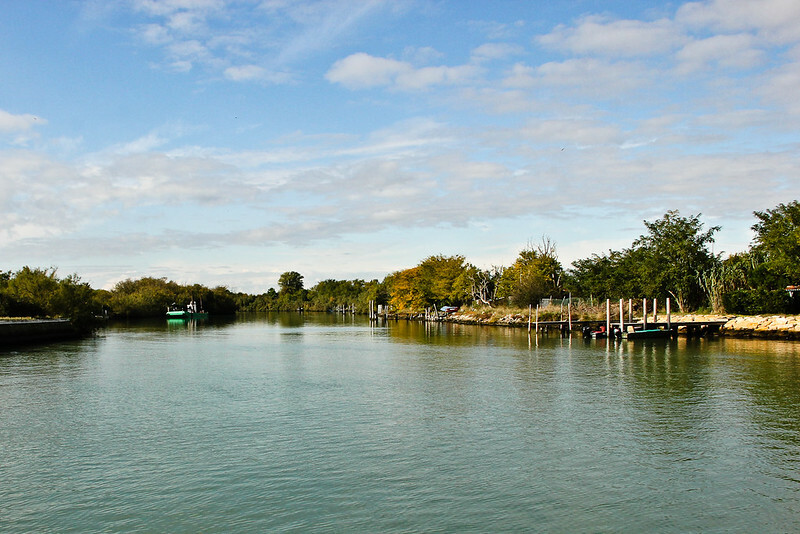 The trip takes 45 minutes and you have to check the schedule because the earliest and latest #12 boats do not include Torcello. The Ponte del Diavolo (“Devil’s Bridge”) has a romantic legend, but the more prosaic explanation is that its name is a corruption of a local family name, “Diavoli”. The bridge was built in the 15th century and restored in 2008. Although it appears to lead to a dead end (private gate) at the end of a lane, you can turn left and walk towards the cathedral on a footpath beside a canal that runs parallel to the canal beside the brick-paved path. 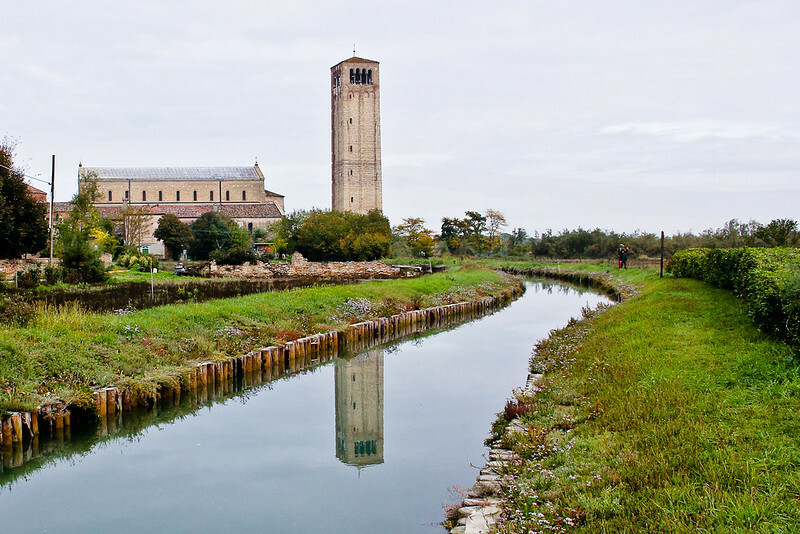 The main site on Torcello is the Cathedral of S. Maria Assunta (founded in 639), photographed below from a muddy footpath, which ends at a small bridge. If you look at the banks of the canal, you’ll notice wooden pilings driven into the ground. 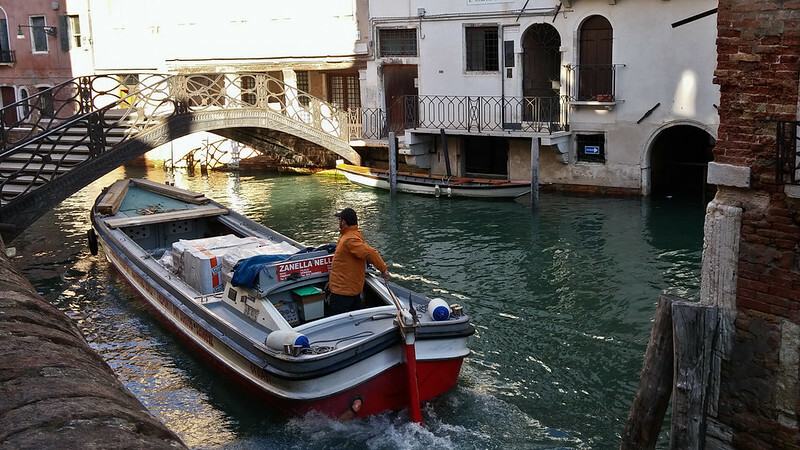 These are the same kind of pilings that support the enormous palazzi of Venice. 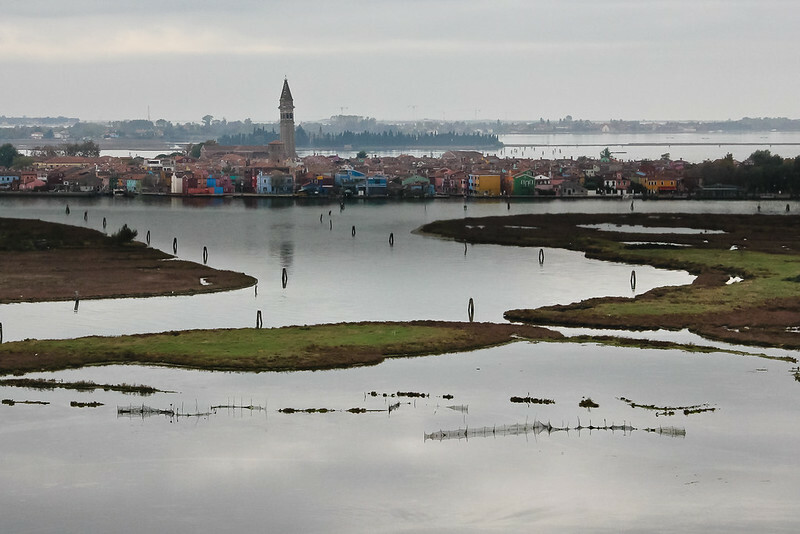 The anaerobic atmosphere of the mud keeps the wood (mostly alder and larch) from rotting and a solid layer of Ice Age-buried soil (“caranto”) may be keeping Venice from sinking. 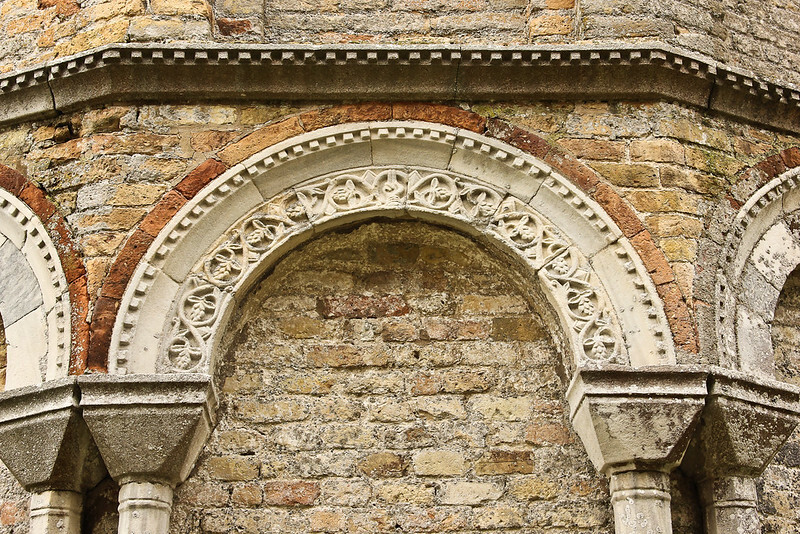 Carved arch on the outside of the apse of the cathedral. 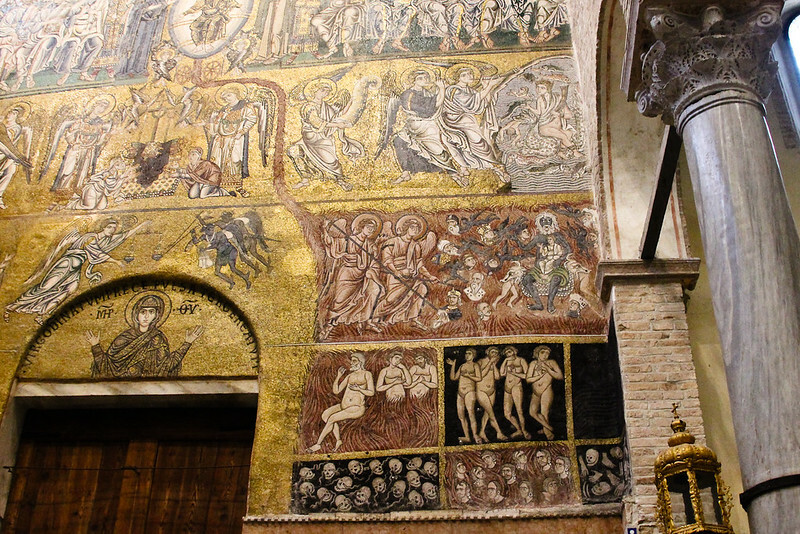 Photo: Byzantine apse mosaic with the Theotokos and saints (probably apostles, but I’d have to check the Greek to make sure). 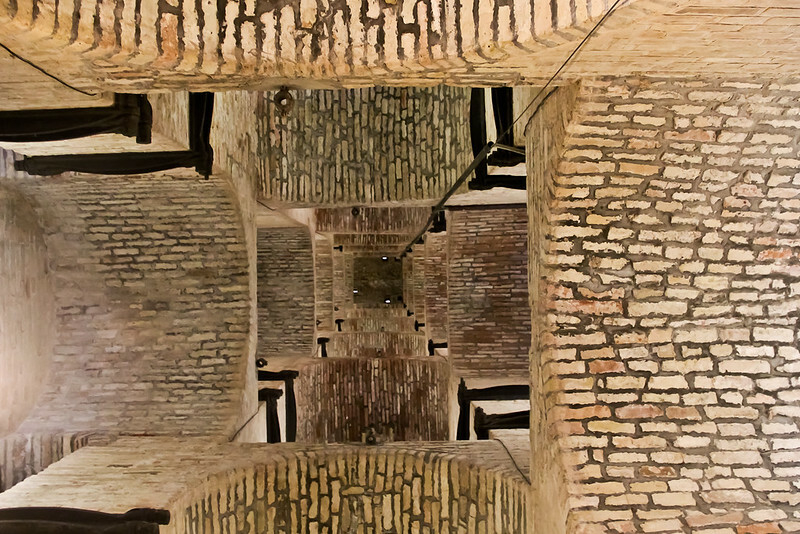 Photo below: View from the bottom of the campanile. 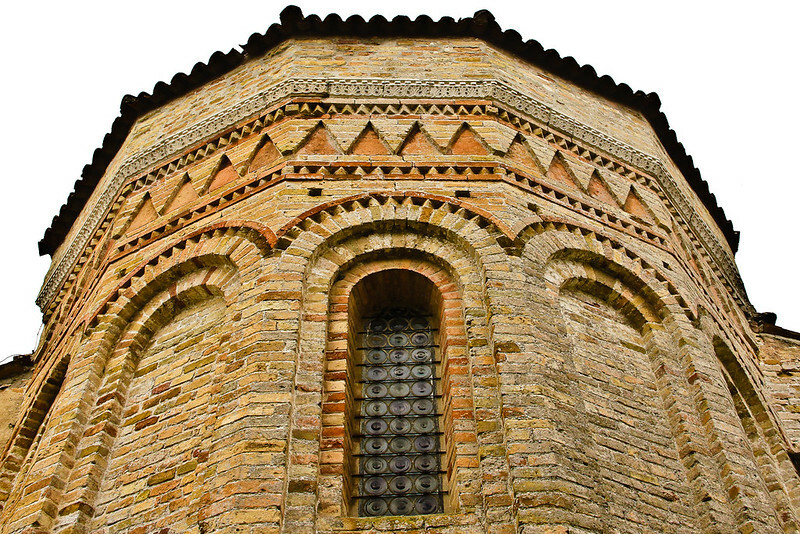 If you climb to the top, you will see how sparsely populated Torcello has become. 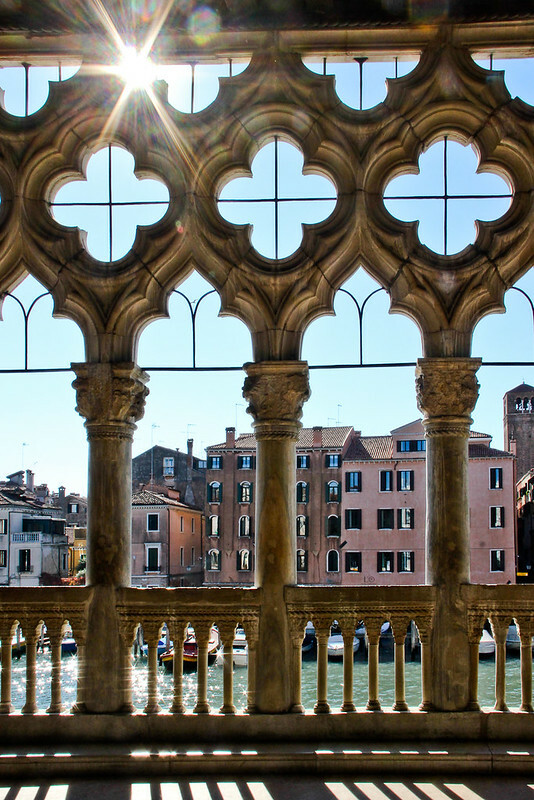 Many structures have vanished entirely because the stones were reused in Venice. Admission to the tower is separate from admission to the cathedral. The ascent is by well-lit ramps, so it’s not a difficult climb. 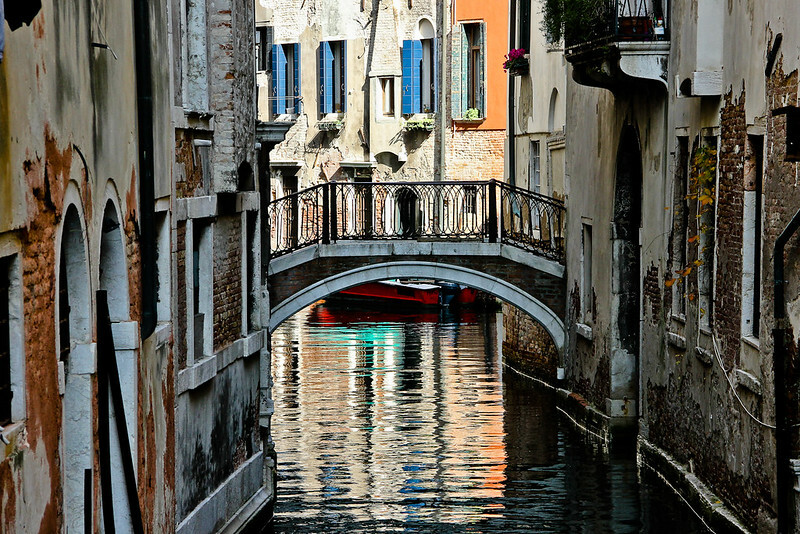 Venice is one of my all-time favorite cities. I never get tired of it. We went for five days last month and did not manage to see or do everything we wanted. We’ll have to go back again! Ca’ d’Oro on the Grand Canal. It’s been converted into a museum and does not allow photography, but you can take pictures on the balcony and the areas outside the gallery itself. We rented a flat in Campo S. Marghareta in Dorsoduro. 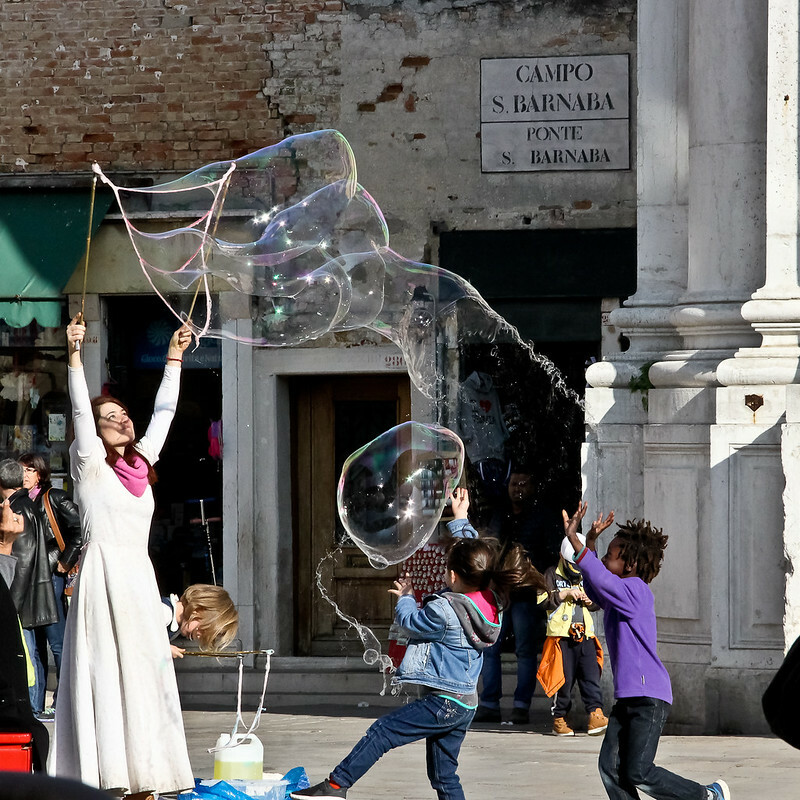 I photographed this bubble-maker in nearby Campo S. Barnaba, just across the canal.